Lancaster was founded as a spectacle maker and optician in 1835 and later became involved in photographic goods around 1876 or a few years earlier. 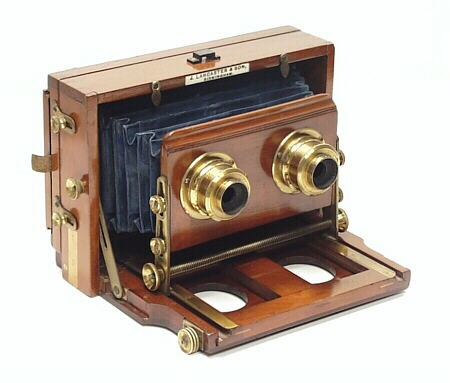 In 1882, Lancaster introduced three series of dry-plate field cameras, the Le Merveilleux, Le Meritore, and Instantograph -- there were also stereo versions of each. The Instantograph was the most advanced of the three camera series while the Le Merveilleux was the least expensive. Primarily a front focusing design constructed of highly polished mahogany and brass trim, the Stereo Instantograph is a wider version of the popular single lens model. As noted in a c1891 Stereo Instantograph Reference, the camera was offered in 6-3/4 x 3-1/4 and 7-1/4 x 4-1/2 inch formats. It also featured a rising front and swing back. It is complete with a non-removable inner septum, stereo plate holder and hard to find brass mounted stereo lens caps (which may have acted as a simple shutter). Lancaster did also offer a stereoscopic shutter.